Gold and silver prices continue to trade range-bound, with silver in the mid $19's and gold oscillating around $1,280/oz as trading resumes in the U.S. following the Memorial Day holiday. Last week, precious metals markets shrugged off some seemingly bullish developments. Russia signed an enormous 30-year contract for natural gas with China (eschewing use of the U.S. dollar), a major bank got busted for manipulating gold prices lower, and there was a military coup in Thailand. For now, the focus and momentum is in stocks. The S&P 500 closed above 1,900 for the first time ever on Friday. There are, however, reasons for stock investors to be cautious. Yields are falling in the bond markets as some investors, nervous about a potential top forming in equities, are buying bonds instead. Those who have long suspected large financial institutions of manipulating gold and silver prices got some vindication last week. 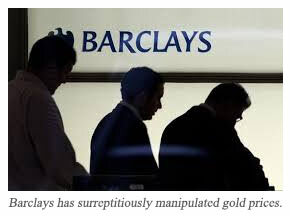 According to news reports out of London, Barclays Bank, a major player in precious metals trading, manipulated gold prices lower to avoid paying £2.3 million to a customer. It will pay a £26 million ($44 million) fine. Regulators launched an investigation when the cheated customer complained about suspicious last-minute timing of a fall in gold prices. They found the bank's trader, Daniel Plunkett, engineered the fall by placing a series of fake sell orders. Barclays would like people to think the cheating was limited to one trader and a single instance. But market watchers have been complaining of similar, seemingly inexplicable price smashes for years -- particularly right before major expiration dates on options. And Barclays, along with other major banks, are paying fines related to interest rate rigging (the LIBOR scandal) and other unscrupulous practices. It seems unlikely this incident is a one-off event. The news will help fuel the shift in public perception of gold and silver price manipulation from conspiracy theory to conspiracy fact. As will the German government investigation currently underway. Last week, a documentary on the subject was released in Germany. It appears the story is getting far more serious attention and focus in Germany than in the U.S. Nevertheless, we expect it will be increasingly difficult for U.S. regulators, media, and investors to ignore evidence unearthed overseas. Until true shortages in the physical gold and silver market emerge, the easily manipulated futures market will continue to serve as the global price-setting mechanism for the precious metals. The Russian national gas company -- Gazprom -- inked a deal to supply roughly $400 billion in natural gas to China over the next 30 years. It is the largest deal ever for Gazprom, and portends even closer economic ties between resource rich Russia and resource hungry China going forward. It also signifies a pivot as Russia, long thought to be dependent on western capital for development, turns east to find investment. The deal is a significant blow to the “petro-dollar” -- a term for the U.S. dollar which has been required for payment in nearly every international energy deal for more than 40 years. Traditionally this sort of deal generates significant demand for dollars, but that demand will be going elsewhere. Gazprom will be paid in either rubles or yuan. The arrangement, announced during Vladimir Putin's visit to Beijing last week, is the culmination of more than 10 years of negotiating. The timing correlates to U.S. intervention and sanctions in the Ukrainian conflict. 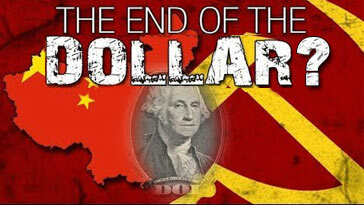 But Russia and China along with other BRIC nations have been critical of dollar-destroying Federal Reserve policy for years. Now they are moving beyond rhetoric to action. Gas deliveries are scheduled to begin in 2018, once pipelines are completed.